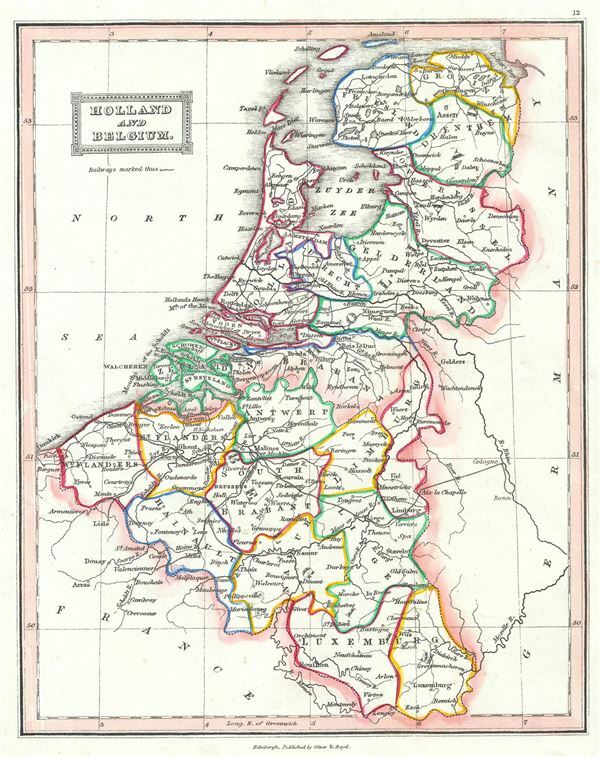 This is a lovely example of the 1845 Thomas Ewing map of Holland (The Netherlands) and Belgium. The map covers the United Kingdom of Netherlands including Holland, Belgium and Luxembourg from the North Sea to the Duchy of Luxembourg. Divided and color coded according to regions and territories, the map identifies various cities, towns, islands, rivers, and an assortment of additional topographical details. In 1830, after the Belgian Revolution led to the secession of Belgium from the United Kingdom of Netherlands into the independent Kingdom of Belgium, Luxembourg, which also took part in the Belgian Revolution, was considered to be a province of the new Belgian state. The Netherlands however, refused to recognize the new country of Belgium until the 1839 Treaty of London. This Treaty also granted Luxembourg the status of Grand Duchy, while its western portion was ceded to Belgium as a province. In 1842, the Grand Duchy of Luxembourg became part of the German Customs Union. Luxembourg, during this period, suffered economic hardships that led to many of its citizens immigrating to the United States. The Second Treaty of London, following the Luxembourg Crisis finally reaffirmed Luxembourg's independence in 1867. This map was published in 1845 by Oliver and Boyd as part of Ewing's New General Atlas.